of scouting in the BSA (Boy Scouts Of America)????? Watch our interview with our pack about girls on WBKO! Honestly...why not? Girls have been involved in scouting for many years through programs like Venturing. Siblings have always been welcome to cub scouting events, meetings and more. Now girls can join their brothers and be recognized for all their accomplishments. This approach to scouting is allowing busy families to offer the same amazing opportunities to the entire family. Q: Why not just join Girl Scouts? A: Girl Scouts are not all inclusive and many families today are too busy to spend time at multiple activities for all of their children. Cub Scouts has recognized this and has encouraged a family atmosphere by including everyone.The program for Cub Scouts can also be more involved in the outdoors and sometimes an adventurous girl does not find what she's looking for with a Girl Scout Troop. We offer family camping, shooting sports, Pinewood Derby, family summer camps and so much more! Q: Will boys and girls be in the same group? A: Each grade and gender is broken off into their own "den" which meet on their own to cover their required activities. We are working on building up our girl dens since they will be separate from the boys in their grade. This year girls might often participate in a meeting with the boys to help cover requirements, especially if there are only a few girls in that grade. We will meet as a "pack" once a month and occasionally for weekend events and activities. Q: Will they change the name of Boy Scouts? 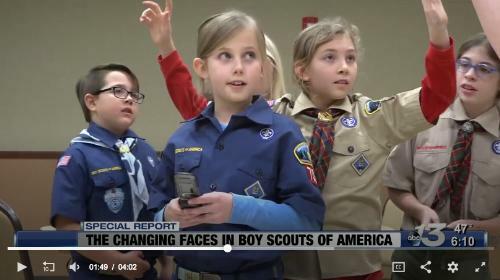 A: While the organization will always remain "BSA" they have changed the official name to "Scouts BSA" instead of Boy Scouts of America in 2019. Children who are in scouting aged K-5 are actually called "Cub Scouts" so there would not be a need to change either way. They have redesigned books and materials to reflect images of girls and be more inclusive. Uniform skorts are also being offered to female scouts but they are welcome to wear shorts or pants as well. This is truly an amazing opportunity for any girl who has ever wanted to camp under the stars, race a cubmobile car down a ramp, or shoot a bow and arrow. If anyone ever has any questions or concerns please be sure to contact one of our leaders and we will be so happy to help!